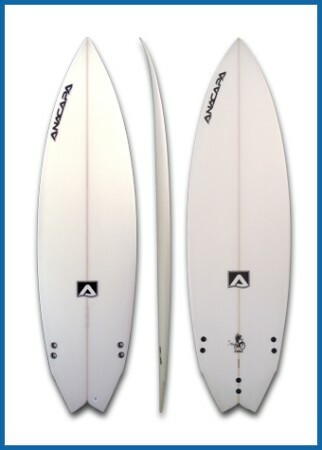 Size: 6' 3" x 19 3/4" x 2 5/8"
The main features of this board are its width, plenty of nose rocker, a full length single concave and the swallow tail. The combination of these four characteristics provide a board that will work really well in small and weak surf. Width gives you a great stable platform while providing buoyancy to make it easier to paddle and keep going even when only moving slowly. 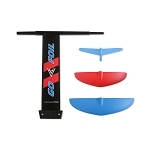 The nose rocker helps get the board on the plane quickly feeding the water to the single concave that gives the board lift and makes it want to get up and plane easily. The swallow tail helps you maintain drive but allows maneuverability by allowing the tail to be wide right until the last 6" of the board. The Tri Fish is made of traditional Foam and Fiberglass construction. It is computer cut, hand finished, glassed, and then sanded to Anacapas Pro-Finish to give you the highest quality board they can make.